Although not the most glamorous position on the ice, a good team needs a good goaltender, and 2017-18 Leaf Masked Men Hockey celebrates those legendary players who man the net. Each sealed box features three hits and three metal cards. This is the same output from the original set in 2017. The 2017-18 edition is also relatively rare, coming in with total production under 150 cases. While 2017-18 Leaf Masked Men Hockey has no base set, the Masked Men Metal line fills that void in a premium style. Centered on the actual masks, the metal cards provide a closeup view for many of the all-time goalie greats. Leaf also added a nod to big-screen goalkeeper Yvon Barrette, who played Denis Lemieux in Slap Shot. Several parallel versions add to the selection. Giving the ladies their due respect, Masked Women Metal debuts with top options such as Kim St-Pierre. The six-card boxes also include three hits that can be autographs or relic cards. Signed choices in 2017-18 Leaf Masked Men Hockey consist of Goalie Graphs and the auto relic Signature Goalies. 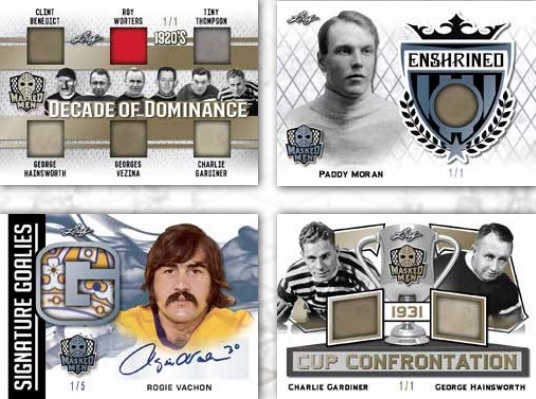 As far as the memorabilia, single-player inserts include Enshrined, Jumbo Goalie Patch, Jumbo Pad and Vintage Goalies. There are also dual-relic 300-Win Club and six-piece Goalie Gear sets. The multi-player relics offer Cup Confrontation duals, plus the four-player Pillars of Hockey, and the six-goalie Decade of Dominance. PARALLEL CARDS: Blue #/35, Purple #/15, Pink #/10, Black #/7, Green #/5, Orange #/3, Red #/2, Gold 1/1, Super 1/1. WAVE PARALLELS: Silver, Blue #/20, Purple #/9, Pink #/6, Black #/5, Green #/4, Orange #/3, Red #/2, Gold 1/1. METALLIC PARALLELS: Emerald #/9, Platinum #/5, Purple #/3, Silver #/2, Gold 1/1, Plates 1/1. METALLIC PARALLELS: Emerald #/9 (Gilbert,Vachon #/7), Platinum #/5, Purple #/3, Silver #/2, Gold 1/1, Plates 1/1. METALLIC PARALLELS: Emerald #/7 or less, Platinum #/5 or less, Purple #/3 (Worsley #/2), Silver #/2, Gold 1/1. METALLIC PARALLELS: Emerald #/7 or #/6, Platinum #/5, Purple #/3 (#04 - #/4), Silver #/2, Gold 1/1. METALLIC PARALLELS: Emerald #/7, Platinum #/5, Purple #/3, Silver #/2, Gold 1/1. METALLIC PARALLELS: Emerald #/5, Platinum #/5 or less, Purple #/3 or #/2, Silver #/2 or 1/1, Gold 1/1. 24 cards. Serial numbered #/6. METALLIC PARALLELS: Emerald #/5, Platinum #/4, Purple #/3, Silver #/2, Gold 1/1. 18 cards. Serial numbered #/15. METALLIC PARALLELS: Emerald #/8, Platinum #/5, Purple #/3, Silver #/2, Gold 1/1. METALLIC PARALLELS: Emerald #/5 (#04 - #/6), Platinum #/4, Purple #/3, Silver #/2, Gold 1/1. METALLIC PARALLELS: Emerald #/4 (Plante #/6), Platinum #/4 or #/3, Purple #/3 or #/2, Silver #/2 or 1/1, Gold 1/1. View the 2017-18 Leaf Masked Men Hockey checklist spreadsheet. Recently bought a couple boxes of this product and pulled a Cup Confrontation dual patch card of Chris Osgood and MA Fleury from 2009 SCF. Fluwry patch has red in it and Osgood patch has orange in it – I think it’s clearly in error. Has anybody else pulled any of these and had the same experience?